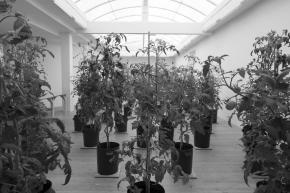 Stedelijk Museum Bureau Amsterdam - Will our Food crop up in the Future? Will our Food crop up in the Future? Stedelijk Museum Bureau Amsterdam organizes, in cooperation with Youth Food Movement, a debate addressing the topic of crop and food security. Crop diversity is one of the most important and most undervalued public goods in the world. The greater the diversity of crops and of the varieties contained within them, the greater the guarantee that our agriculture can endure any disaster, from drought to diseases. The opposite is also true. A decrease in diversity increases the likelihood that the biological basis of our food disappears. Will our food crop up in the future? will bring together artists, scientists and thinkers to discuss on the state of the worlds crop diversity and on ways to preserve and promote it. The genetic diversity of domesticated crops, such as tomatoes, corn and potatoes, was developed over millennia. However, this diversity has declined rapidly in conjunction with the dramatic changes that agriculture and society have undergone within the 20th century. Among the driving factors of this decline are, the monopolization of the seed market (with only three companies controlling more than half of the global commercial seed market), our focus on a few varieties that fit current trade, growing, harvesting and processing requirements, and the displacement and disappearance of smallholder farms (which offer the ecological niches in which this diversity has traditionally been cultivated). Due to the increasing environmental and socio-economical pressure on the sources of our food the question arises: How can we keep our crop diversity alive? Several institutions and individuals are engaged in the preservation of crop diversity. The Global Crop Diversity Trust, for example, is particularly aiming for the so-called ex situ conservation, saving seeds in gene banks. The largest collection of seeds, can be found in a huge vault under the Arctic ice in Svalbard, Norway. This world seed bank with seeds of plants from all over the world has also been described as the ark of Noah. Simultaneously there are numerous groups who aim towards keeping varieties alive in the field, so-called in situ conservation. The Slow Food Foundation, for example, has created a program called the Arc of Taste, pinpointing and protecting crops and breeds which are at risk of extinction, that are linked to a specific area, to the memory and identity of a group and to local traditions. NGOs such as the ETC Group or La Via Campensina advocate the rights and survival of small scale farms, especially in the so-called Global South, where the main guardians of biodiversity are located. And there are thousands of “amateur” gardeners who participate in exchange systems, 'seed swaps', to keep varieties alive in situ. Despite these different ways and programs to protect and promote our crops, the diversity of the biological source of our food is not guaranteed. The Food and Agriculture Organization of the United Nations expects a decrease in crop diversity by 33 percent by 2050 compared to now. In the way the food industry is designed at the moment we will become even more dependent on the 12 species that provide 80% of our calories. What is currently being done to limit the loss of biodiversity to a minimum? What can be developed at local and international levels to stimulate the conservation of biodiversity? How can we ensure that the general public, especially farmers, have access to seed ? What can we do to guarantee the future of our food? Luc Groot works as an advocacy consultant at Agriterra. Agriterra was founded in 1997 by Dutch rural organizations to develop projects that range from rural tourism to improving potato production. Agriterra advises farmers and agricultural organizations all over the world, using Dutch expertise from agriculture and the cooperative world. Agriterra also helps farmers to organize themselves to counteract governmental institutions. In total Agriterra cooperates with about 80 rural people's organizations in Latin America, Africa, Asia and Central and Eastern Europe, and with about 30 organizations in the Netherlands. Janno Lanjouw is co-founder and program director of Food Film Festival and journalist. The Food Film Festival is a three-day festival where you can immerse yourself in the world of food. You can watch the best food films, listen to presentations, join The Great Debate, learn from masters in the kitchen during workshops and eat in the restaurant headed by the star chef. Not only does FFF focus on the culinary side of food, it also critically examines our food system. Joris Lohman is chairman of the Youth Food Movement, and board member of Slow Food International. The Youth Food Movement (YFM) is a youth movement that is committed to a fairer and healthier food system. Through events such as eat-ins, debates, the Food Film Festival and the YFM Academy, they try to make youngsters more aware about the food choices they make. Food seems to be quite normal, but it is far from that. Indeed, it is one of the most complex topics to broach, in interface with almost all social and environmental issues of our time. Bert Visser is director of the Centrum voor Genetische Bronnen Nederland (CGN). CGN focuses on conservation and use of vegetable crops, rare livestock breeds, and native trees and shrubs. This is done by creating collections stored in Wageningen and by supporting initiatives that maintain the diversity in the field. Visser is on national and international level involved in policy making in the field of genetic diversity. He is advisor of an international program of Oxfam Novib, which focuses on strengthening the rights of small-scale farmers in the tropics. Uli Westphal (1980) is a visual artist who, through a variety of media, explores how humans perceive, depict and transform the natural world. He studied mutimedia and environmental art at the Aki in Enschede, NL and at the MICA, in Baltimore USA. He obtained his MA, Art in Context from the Udk in Berlin, Germany. Recent solo-exhibitions include ‘Cornucopia’ at Ming Studios in Boise, Idaho, USA (2014); ‘Human Nature’ at Odalys, Galeria de Arte in Caracas, Venezuela (2013); ‘Supernaturale’ at NOPX in Torino, Italy (2012).